I’m so glad there are two weekend days. The first one usually gets lost with TV, feeding everyone, a unproductive nap that leaves me more sleepy than before and just a little sewing. I still have 5 1/2 hours left in ‘the day’, but there is still one more meal to provide and laundry piled up on the bed to fold. I hope to get my Avalon block pieced tonight though, so another post may be warranted tomorrow! I’m still so in love with this quilt and can’t wait to see it grow over the year. Last night, I decided to add a decorative yo-yo to Block 5, using the background fabric from the block. I like the results. A little surprise! I also started getting nervous about the state of my focus fabric, which is mostly obtained from a panel I purchased in the Palm Court collection by Benartex. It isn’t the easiest fabric group to find, but I had purchased it, and other items from the collection, from Rossville Quilts. I decided to get another panel so I could make it comfortably to the end of this quilt with as much fussy cutting as I wanted. Hope you are having a quilty weekend, or doing something that makes you happy! ← Another Clover? Am I crazy?? Oh Jennifer — I love your yo-yo in the center of Block 5 — utterly original and charming! 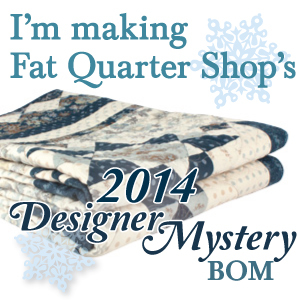 And seeing your medallion and blocks laid out on the bed makes me see just how wonderful your quilt is going to be. I think you were smart to get another panel of the Benartex Palm Court collection but oh! wasn’t it hard to cut into that panel?? I was so excited to see all your quilt blocks laid out together. Your quilt is going to be incredible! All of the points look perfect and the colors play off each other. I love your block 5 and your yo-yo. What a cute little unexpected surprise to find. I also bought another yard of the focus fabric. I was afraid I would not have enough to comfortably cut out anything I wanted. I am still tiling. 😦 But we are getting close to being done, and DH is very happy. 🙂 I can’t wait to get started on block 5. Hopefully next weekend.